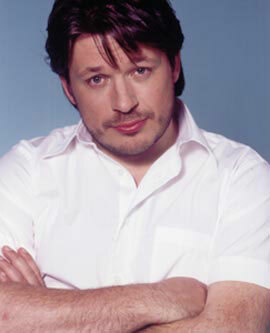 Next month at the Edinburgh Festival, Richard Herring performs his first solo stand-up show in over 10 years. We caught up with him to find out about his "messiah obsession" and to find out what happened to the legendary Lee & Herring. For the past couple of years it seems he's been beavering away behind the scenes writing Sky One's comedy show "Al Murray Pub Landlord". Read on to find out about the show which will ultimately be dubbed "The Marilyn Manson" of the Edinburgh Festival. Q: What can we expect from the Edinburgh shows? A: Its about jesus, but also about my own claims to be the new messiah - I won't spoil it and say whether I actually am or not!!! There's a bit of dramatic tension to find out whether I'll turn out to be the new messiah or not. But its looking at Jesus from my own personal perspective which is of pretty much life-long Atheist from about 6 years old. But its actually quite fair to Jesus - in fact i think he comes out of it quite well. Q: Where do you come up with the whole "jesus" concept? A: This is just a subject I was interested in. I haven't actually done stand-up on my own for about 10 years. Jesus is just something I've always been interested in reading about, I've always been interested in the paranormal and stuff, but from a cynics point of view. I'm kind of obsessed with it all this stuff to a weird degree so the idea of it just slightly came from a scholarly book about how Jesus was just a Jew who was misinterpreted by history and by his followers. I was reading that and slagging off my mum and dad who are Christians and my mum was saying "If you don't believe in it why do you spend all your reading about it and talking about it". I thought it would be an interesting springboard to look at that and myself. With this its quite easy cos' the bibles got lots of inconsistencies and funny things that you can look at and there's a lot of stuff from my life that has been exaggerated. This sort of came from me and Stew and we used to do a joke where i'd go "I'm not saying i'm Jesus, that's for other people to say!!!". Its those things hopefully coming together in an entertaining way in an hour long show. Q: So you're going to be the Marilyn Manson of the Edinburgh Festival? A: Its possible!!! It seems weird to think that when "Life Of Brian" came out and all the hassle that got with people protesting and I think if that came out now people wouldn't take a blind bit of notice. I think this would be seen as being more blasphemous than "Life Of Brian". I think if you come to show, even though there are things that would offend really evangelical christians, I think normal Christians would laugh at it. My parents are christians and they find our christian stuff quite funny. Q: Are you enjoying getting back on the stage? A: It was difficult doing it again after so long. I was doing stand-up on my own about 10 years ago and I never quite enjoyed it ,but i thought i'd give it another go. I always felt it was difficult if you're white, middle class and in his 20's because that's just about everyone in stand-up so it can be very difficult to find your little niche. I think people do jokes about religion, but i wouldn't say they are entirely scholared, whereas I actually do know quite a lot about the subject. It arrives at an interesting conclusion it is safe to say!!! Q: Al Murray Pub Landlord is the other main project your working isn't it? A: Well it was last year cos' we did 22 episodes of this Sitcom. It was extremely hard and I was writing nearly all of them, Stew had a go at a couple and Al was obviously chipping in with material, but it was writing 22 episodes in 50 weeks. It was a very stressful time so I kind of had a break after all that. Its a good show and I really like it but were only doing 15 shows this time. Q: And Lee & Herring - will we ever see the return of the duo? A: Its in the lap of the gods - which don't exist obviously. There's no reason we shouldn't and we haven't fallen out or anything. We've got this sitcom idea which we've been touting round for a few years about people being held hostage. I think it would be quite a good sit-com but I wish it had come out before Big Brother - its a similar vibe really except its scripted obviously. I think me and Stew have always tried to do original stuff and strange stuff about people on the fringes of society in terms of being odd and obsessive. I think this Jesus show is about me being obsessed with Jesus and in the past its been cats milk or a guy obsessed with hobbies. I think on the net you get a lot of fans who appreciate it but they are like that so that's why they appreciate it. After what can only be described as "a farce" on the BBC's part in terms of scheduling Stewart Lee has moved into other areas. His debut novel "The Perfect Fool" hit the shops this week and tells the story of 7 mad individuals in search of the Holy Grail and he also writes for the Sunday Times music column. We caught up to relive the best moments of "Fist Of Fun" and Attention Scum" and find out about this new book of his. 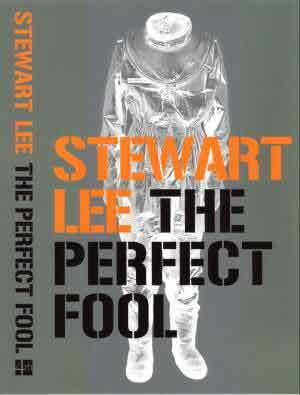 Q: "The Perfect Fool" hits the shops this week. For the readers out there could you explain the basic plot? A: Its about 2 blokes that are in a Dire Straits cover band that then want to go and find their 60s rock hero in America and form a band with them. And there's a woman who's had a bit of a dodgy past who's on the run being accused of being a serial killer. A man who's lost his memory but thought that he might have once been an Astronought involved in hiding the Holy Grail in space - And these guys meet up and have an adventure. Q: Its must have been a pretty big change from doing the stand-up or sketch based shows though? A: Well yeah and no. The weird thing is, it sort of came at a good time really. The stand up I do has been getting longer and longer and more and more complicated - to the point where I find it really hard to do 20 minute sets now - because it takes me about 15 minutes to get to establish the premise of what I'm talking about. And actually a lot of ideas that I've wanted to do live were loads better for the novel anyway. I think I got to the point where instead of doing stand-up and complaining about how we have to do it in noisy clubs it was probably better to not worry about it and try and do the things I might have done in stand-up somewhere else. Q: How long have you had the idea of a novel? A: Well I started it in 1992. And then I had lots and lots of bits of it but I didn't have a clue how to fit them together until about 1996. Then about 1998/9 i'd got 30,000 words and did the rest between then and last Christmas. Q: I asked Richard this question as well. How do you come up with the character ideas? A: In "Fist of Fun" and "This Morning....with Richard not Judy" they came from all different things. The Curious Orange came from looking at my girlfriends hair which was orange and she said something that was curious - and it reminded me of title of a 1960s Swedish film and ballet done by the Fall called "I Am The Curious Orange - so I thought what if there was an orange that was curious about stuff. The Weak Lemon drink idea came from this bloke at my school called Alan Pritchard who just used to find the idea of weak lemon drink really funny. He just used to say "Would you like a weak lemon drink?" and the character of that just came from people who were obsessed by things. The way that we performed in that was just an exaggeration of how me and Rich used to act together. We used to write each others bits really so when people say one character was funny and the other wasn't they really should be blaming the other person.